This is a great go-to gift that is sure to be used and admired! Perfect for housewarmings, anniversaries (wood is the traditional material for 5th year anniversaries), and holiday gifts! Our laser engraving experts will etch your last name and will include your initial in a beautiful script font. 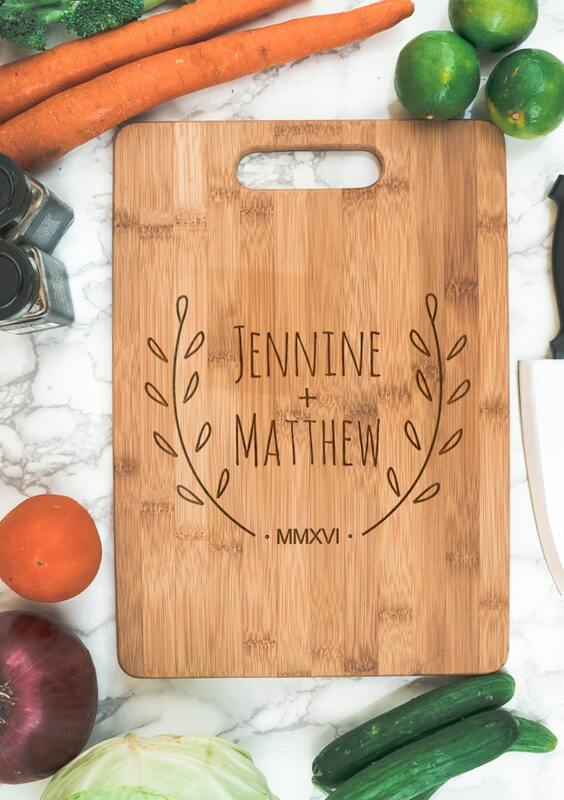 Made of high quality bamboo, this cutting board is a great size, measuring 13.75" x 9.75 x 5/8". Not too big to be cumbersome, but large enough to be functional! We recommend displaying the engraved side, and using the opposite side to cut. 1) Couple's name, for example: "Jennine, Matthew"
2) A year, for example "2016". We will convert the year to Roman numeral number. - Please handwash this item. - Color and grain of bamboo may vary. Color and depth of engraving may also vary slightly from what is shown in the example photo.